Hi, this is Clyde, editor of the NRS e-News email newsletter. I'm here to talk about shoulder injury in boaters and how to hopefully prevent it. I'm not a medical professional, but I have personal experience with this injury and have information to share from an orthopedic surgeon and physical therapists. I'll include my personal experience at the end of the article for those who are interested. 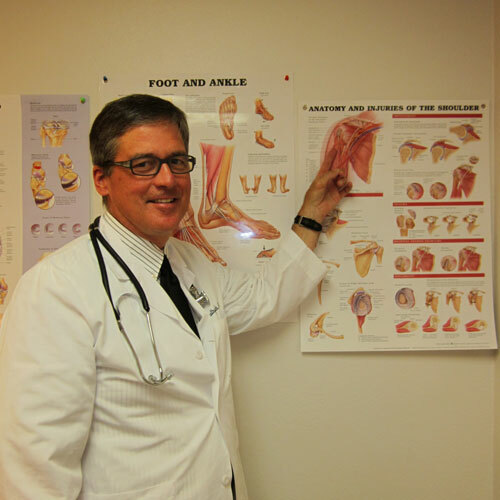 Interview with Dr. Timothy J. Flock, M.D., Lewiston, Idaho, an orthopedic specialist for 22 years. “Most of the problems of the shoulder are rotator cuff related. The rotator cuff is a sleeve of four muscles, and their associated tendons, in the shoulder. 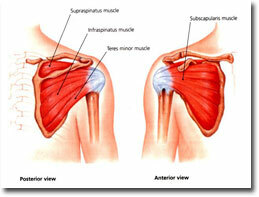 The one on the top, the superior aspect of the shoulder, is the supraspinatus. The one in the front is called the subscapularis. Then there are two in the back, the intraspinatus and the teres minor. And in the middle of the rotator cuff, on top, is the biceps tendon, which is also part of the rotator cuff. The rotator cuff parts most susceptible to injury and degeneration are the supraspinatus and biceps tendon. “Not that much arthritis occurs in the shoulder because it's not a weight-bearing joint. So, most problems with athletes and recreational people are related to the rotator cuff. It becomes problematic as part of the aging process and also from use. The key to preventing problems is to maximize the tone of the rotator cuff muscles and to minimize things that will cause them to degenerate. “The way to prevent degeneration is to avoid activities with the arm straight up in the air, rather than out to the side. For example, for a tennis player or a thrower it's better for the arm to move in a three-quarters motion rather than in a completely overhand motion. 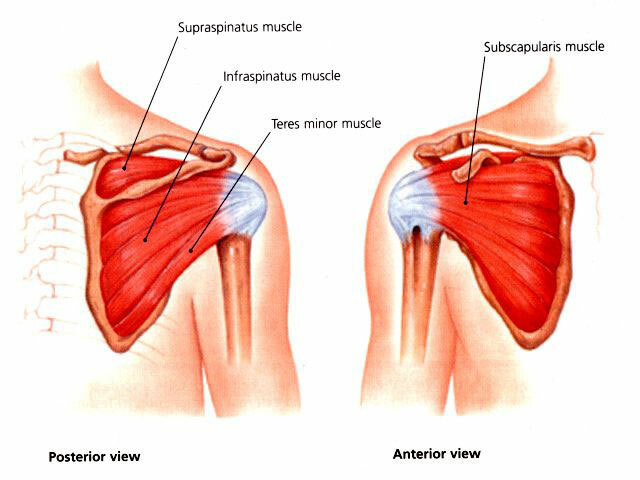 muscle groups in the shoulder area. Because much of the activity in paddling and rowing is done with the arms, kayakers and rafters are especially susceptible to shoulder injury, both from trauma and just plain wear and tear. The shoulder has a ball (the head of the humerus arm bone) and socket (in the scapula or shoulder blade) joint. It's one of the most movable joints in the body, but since the socket in the scapula is quite shallow, the joint is vulnerable to injury. Traumatic shoulder injury in boaters occurs when the arm and elbow are elevated above the shoulder and force is applied to them. With kayakers, this happens when using improper technique while bracing and rolling. With rafters, it can happen when a wave violently thrusts the oar handle up. To help prevent injury, it's important to keep the elbows pointed down and below shoulder level. Practicing and perfecting good paddling and rowing techniques is essential to good shoulder health. Then, as Dr. Flock says, the other part of ensuring shoulder health is to strengthen the muscles that make up the rotator cuff. There are various techniques for exercising these muscles. Here we'll cover the use of rubber tubing to supply resistance. There are numerous commercial tubing/band exercise systems on the market. Also, you can check with a local physical therapy clinic to score a set, or put one together from hardware store components. 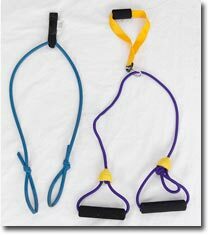 You'll use the tubing to perform the exercises we'll show you. These exercises are for strengthening a healthy shoulder. If you are experiencing shoulder problems, see a medical professional. If any of these exercises cause pain, stop doing them and consult with a medical professional. This could be a sign that you already have damage. The exercise illustrations clearly indicate how far you should extend your arm while performing the exercises. Don't exceed the distances shown. Start out with 10 reps for each exercise and for each arm. Work up to 15 reps.
We recommend no fewer than three exercise sessions a week, and it won't hurt to do them every day. 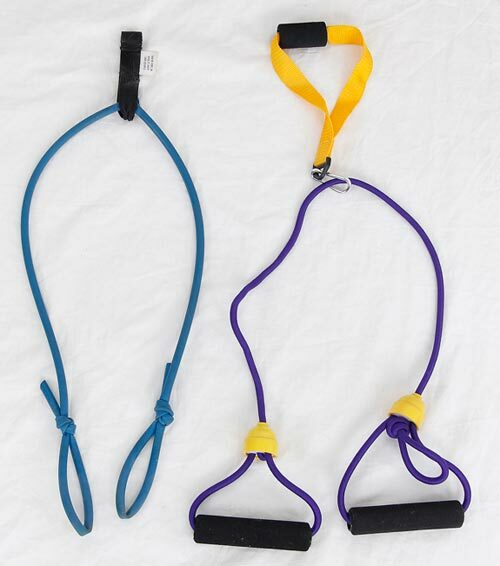 is part of a commercial home workout set. Both can be anchored in a closed door. Rotator cuff muscle strengthening exercises. Click for a larger image and the option to print a copy. Anchor your tubing to something solid, like a stair rail or porch post. Some tubing systems, like the ones pictured, let you anchor them in a closed door. Use a smooth, steady motion on both the pull and release to get the best benefit. Here is a sheet of illustrations for exercises that will work all the muscles of the rotator cuff. It's in the PDF Format. If you don't have Adobe Reader, click here for a free download. Click on the illustration to view and print off a copy. Follow this exercise plan, or another good one, and use good paddling and rowing techniques. To do what we do, you've got to have healthy shoulders. In 2001, I started to have pain in my left shoulder. It scared the crap out of me. I'd been paddling and rowing for 25 years and it had become an important part of my life – heck, of my whole identity. What was I going to do if I couldn't raft anymore? I usually put off going to a doctor as long as I can, but this sent me packing to find help. Fortunately, I found good help, in the form of Dr. Flock. He did all the testing, found that I did have a tear and recommended surgery. I put it off until after boating season and then had the carving and sewing done. Ten years later, my left shoulder is still top notch. Earlier this year I started to feel some looseness in my right shoulder, so I pulled out the rubber tubing I'd been given during my physical therapy after the surgery. I started doing the exercises again, on both shoulders, five days a week. The right shoulder joint has tightened up and it seems things are back to normal. I've got about 235 miles of rowing on the ol' shoulders so far this year, and it's feeling good. Best of success to all of you in staying healthy so you can do the things you love. Remember the active person's lament: "Lordy, if I'd known I was going to live this long, I'd have taken better care of myself!"